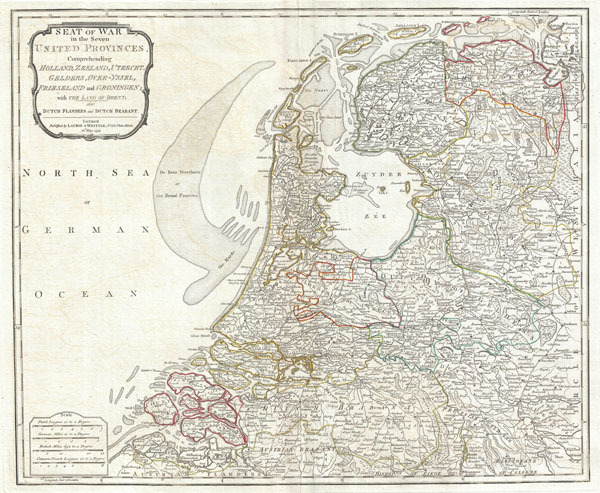 Seat of War in the Seven United Provinces, Comprehending Holland, Zeeland, Utrecht, Gelders, Over-Yssel, Frieseland and Groningen; with The Land of Drent, also Dutch Flanders and Dutch Brabant. An extraordinary 1794 map of Holland or the Netherlands by Laurie and Whittle. Covers from Zeeland eastward as far as the Circle of Westphalia, north to the mouth of the Ems River, and south as far as the Bishopric of Liege. Includes the modern day nation of the Netherlands as well as adjacent parts of Germany and Belgium. Renders the entire region in extraordinary detail offering both topographical and political information. Undersea shoals, canals, swamps, and lakes are beautiful rendered in fine engraving. Color coded according to region. A key and title cartouche appear in the upper left quadrant . Published by Laurie & Whittle for Kitchin's 1794 General Atlas. Rumsey 2310.023. OCLC 7160203. Phillips (Atlases), 4300, 6008-12. Bancroft Library G5200 1794.A5. Shirley, R., Maps in the atlases of the British Library, T.LAU-1c (1799 ed.). National Maritime Museum, 375 (3rd ed. 1801).